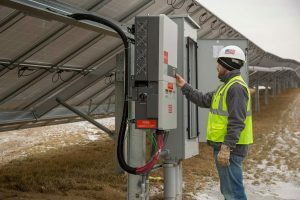 The Warwick Valley Central School District’s Solar Power Project control panels, located on Sanfordville Road, began generating electricity Tuesday, Feb. 6, when inspectors from Orange and Rockland powered it up. Con Edison Solutions Senior Engineer Gavin Angle inspects one of the Warwick Valley Central School District’s Solar Power Project control panels. The 2.419 megawatt solar powered array is the largest school district-owned solar project in New York. It will generate approximately 2.9 million kilowatt hours of electricity each year, enough to likely offset the District’s entire electricity bill through monetary credits. Currently, the District spends about $600,000 annually on electricity. Power generated by the Warwick Valley Solar Power Project will feed into Orange & Rockland’s power grid and, in exchange, the District will receive a per/megawatt monetary credit. The solar power project is among several green initiatives in the District. Other environmental efforts include the purchase of propane-powered school buses, LED lighting, a food waste disposal system, a rain garden at the High School, green education programs for students, and a District sustainability policy. 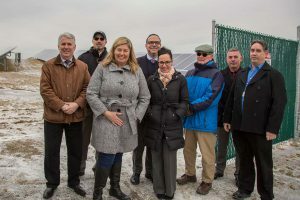 Members of the WVCSD Community gathered at the site of the District’s Solar Power Project on Feb. 6, when it powered up for the first time. From left to right: Timothy Holmes, assistant superintendent for business; engineer Mark Ruhnke; Sharon Davis, vice-president of the WVCSD Board of Education; District Superintendent Dr. David Leach; Cindy Leandro, assistant superintendent for human resources; school board member David Eaton; construction manager Sakis Mastorakis; and Steven Salvato, the district’s director of buildings and grounds.